« 8pm Swing Dance Party and West Coast Classes! 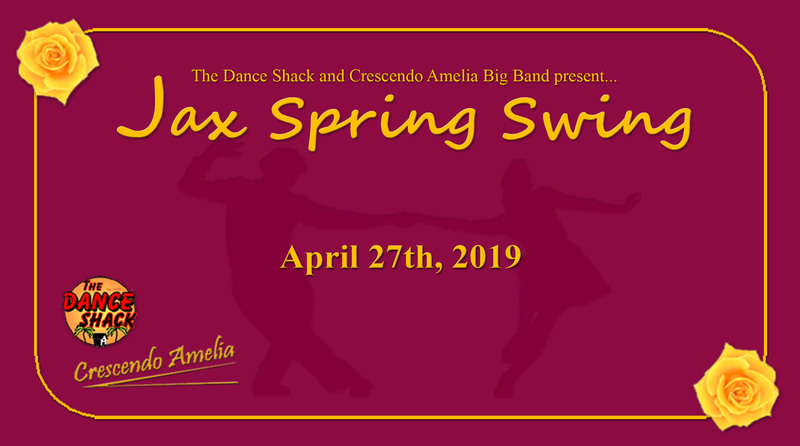 The Dance Shack and Crescendo Amelia Big Band present to you a full day of Lindy workshops capped off with dancing to NE Florida’s premier 14 piece big band, it will be a night to remember! There will also be a just-for-fun mix and match competition with a cash prize going to the winners. This is the first event of it’s kind in Jacksonville! If you want us to shut up and give you your tickets, scroll down to the bottom to purchase. Pick an All Day Pass (or a College All Day Pass if you’re a student). Add a Mix and Match Pass if you want to enter the contest! Get a load of the wonderful workshops we have planned for you! There are two workshop going on at the same time for any given hour, so when you purchase your ticket, you have a choice to make. But no matter which workshop you choose to take, you win! Trouble following your partner? Be a better partner! Instead of asking, “what if my partner does this?” learn to become accountable for your own movement. You will make astronomical improvement in your dancing, regardless of your level. Discover the freedom to move on your own and explore your creativity. These techniques are the cornerstone of being able to play with your partner, the music, and creating a uniquely exciting dance every time – or have a ball on your own! It’s the way that you do it! This workshop covers the techniques that will make your dance feel more comfortable, and make it look like Lindy. These skill are essential to rhythm and communication with your partner. This is an exhilarating advanced class that requires a partner, and a brief audition 5 minutes before the class start time. You’ll learn some basic aerials that you can use in jam circles and performances. Let’s defy gravity! 12:15 pm Lunch Break – Not a workshop, but still worth taking! Many people don’t think about all the elements that make a good connection. In this class we’ll be talking about every element that makes a good connection, from your fingers to your toes. How your feet connect to the ground, and back through the hands to your partner. We’ll also explore some fun connection ideas and twists! Music is the reason for the dance! Understanding how to listen to it and pick up on themes will help you pull the notes right into your movement and steps. We’re even bringing in a guest musician to help break it down for you! Fast dancing is a thrill ride, and it’s impossible to keep up with it without good, efficient technique! This workshop will show you common techniques used to train your body to move quickly, and how movement changes in a partnership. P.S. Bring plenty of water and prepare to sweat! Sure jam circles are an amazing spectacles, but don’t just watch them! Join them! This class will show you how to be part of the fun. You’ll learn etiquette, entering and exiting the circle, safety, and more. This open level workshop will cover all the fundamentals you need to embrace this historic Lindy tradition! >>PLEASE NOTE<< Online registration will close Thursday evening, April 25th at 11:30 PM. Workshop registration will then be first come first serve a the door. Workshop capacities are limited so the sooner you register the better chances you have of selecting the ones you want most. Preliminaries – Mix and Matches are tons of fun! Contestants sign up individually. In the preliminary round, you will be randomly paired with several partners and dance to a variety of tempos. The selected individuals will continue to finals. Finals will be at 9:30pm during the main dance. Contestants will be paired randomly and judged as a couple. Winners will be announced at 10:30pm and awarded a cash prize! We’re ecstatic to have the Crescendo Amelia Big Band as our co-host for this event. Boasting a whopping 14-piece band, and a love of swing music, you will experience the thrill of dancing’s golden days! There’s nothing like dancing to a live band, and a big band is even better. When the music of Crescendo Amelia fills the room, you will feel the rhythm from head to toe and be inspired to tear up the floor! This event will be held at the Riverside Avenue Christian Church. We need volunteers! If you are interested in volunteering for this event, please call us at (904) 329-2946 to get details. Click here to visit our Facebook event page and connect with others to make housing arrangements. P.S. Have a business? Want to help support this event? We want to help support our local and small businesses. Call (904) 329-2946 to ask about vendor spots and sponsorship opportunities. If you want to join in on the fun and you don’t know how to dance, The Dance Shack offers Beginner, Intermediate, and Advanced Lindy classes every Monday night at 8:15pm. Call (904) 329-2946 for details. Once you click “Proceed to checkout” you will be asked to make any selections necessary to complete your registration. Then, simply stop by the registration table when you arrive at the event to check in! Unlimited available	 All Day Pass $65.00 All day pass for the Jax Spring Swing event. Includes all workshops and evening dance. Does NOT include the mix and match. Unlimited available	 College Students All Day Pass $40.00 College students only! Student ID required at the door. All day pass for the Jax Spring Swing event. Includes all workshops and evening dance. Does NOT include the mix and match. Unlimited available	 Mix and Match Pass $5.00 Mix and Match competition pass. This pass requires one of the All Day Passes, or the Dance Only Pass. Prelims will be held at 4pm, and the finals at 9:30pm. Winners announced at 10:30pm and are awarded a cash prize.